About 3 months into Joining Young Living, I switched to their hair care line and have been so creative that I’ve finally found what works for me and my type of curly hair. 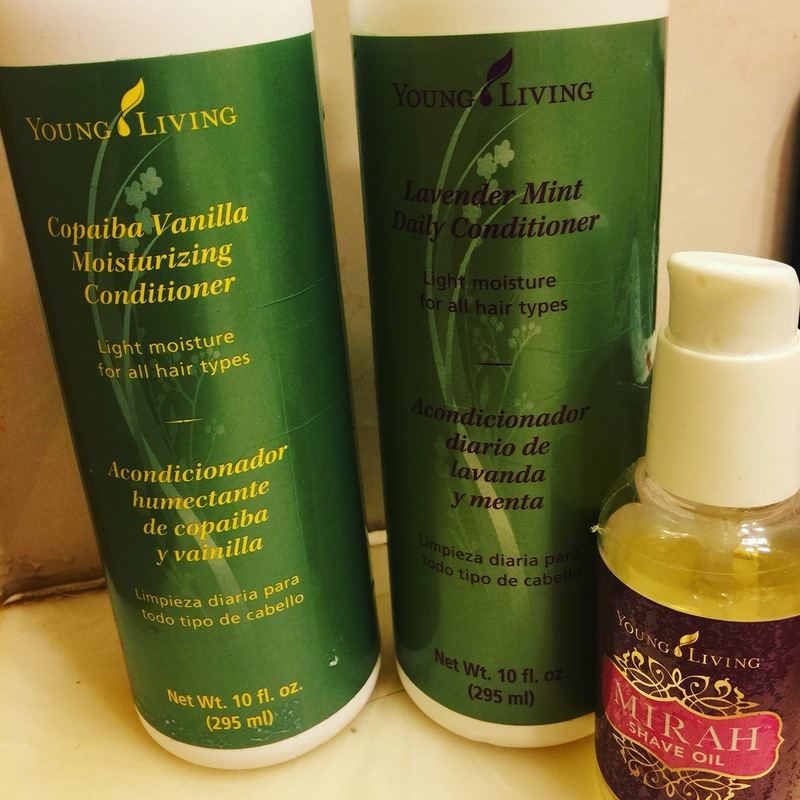 My first purchase was the Copaiba Vanilla shampoo and conditioner. I bought these two with intentions of using the conditioner as a cowash and the shampoo as a one a month clarifier. This line is moisturizing, however Young Living offers two other lines for other hair types. I’m so excited about sharing this information because I practiced with the moisturizing line for several months now and I finally found what works. First off, I only cowash my hair once every 4 days. And I use the shampoo about one time a month or more often depending what I expose my hair to. In between my washes, I refresh with a few drops of Argan oil mixed with a few drops of peppermint or Purification. I also have a spray bottle of just water on hand to wet my hair for restyling. With this particular time I washed my hair, I used the Copaiba Vanilla Conditioner in my hair dry as a deep conditioner. I massaged it on my scalp and the ends of my hair. After waiting about 20 minutes, I rinsed. A tip for volume is to wash your hair upside down bent over a tub. Then I apply more Copaiba Vanilla to thoroughly wash all of my hair paying special attention to my scalp. I don’t know about you, but not only does my curly frizzy hair lean more towards dry, but so does my scalp. I wash for about 3-5 minutes. After rinsing, I apply Lavender Mint Conditioner as a leave-in. This has moisture but not as much as the Copaiba Vanilla. Plus it adds volume. Don’t rinse. I use just a tiny amount of this product mostly in the middle and the ends of my hair. Next, towel dry with a tee shirt or a micro fiber towel. This practice is so much more gentle on your curls. I dry my hair by scrunching from ends to root. After my hair is no longer dripping wet, add Mirah Shave Oil. Great for shaving, or after shave or as a moisturizer for your hair. Here’s my hair wet just after using all three of the products mentioned above. Now to dry my hair. On this night, I had time to let it air dry which took several hours. Don’t mind the little white spots below my lip. I’m having a few hormonal zits going on for which I applied Thieves toothpaste. morning, undo the scrunchy to get this. I’m sure your results will be better than mine because my hair is thin and my curls are fragile but also versatile. Depending on my hairs mood, my curls are tighter or looser. But this is what my hair decided on this day. elp the curls around my face with a half inch curling iron, mostly because of my cowlicks. I know it’s not special or fantastic but you have no idea how much those products helped with frizz, Control and volume. The best part about this, I completely did my hair with Essential Oils and all plant based products. If I were to tell you to start somewhere, it would be with the Mirah shave oil. What do you think of my results? Interested in joining Young Living at get all your products at whole sale? Contact me for more information. Text only 717-885-7754 and mention this blog post.